The past decade has witnessed a revolution in evolutionary biology of fungi. We have gone from analyzing small, selected sets of genes to whole genomes. The result is a transformative effect on our understanding of both the patterns and processes associated with fungal evolution. This talk will provide a general over view of the major groups of fungi and the evolutionary processes that have changed them through time and through associations with other organisms, especially plants. Dr. Spatafora is our Foray Mycologist. Spatafora was born and raised in Louisiana. He received a BS in Zoology from Louisiana Tech University in 1986 and a PhD in Botany from Louisiana State University in 1992. He then went to Duke University where he did a postdoc in Rytas Vilgalys’ laboratory. 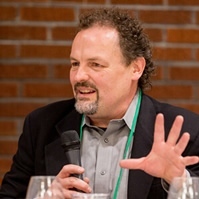 He began in current position in Botany and Plant Pathology at Oregon State University in 1995 and was recently recognized as an OSU Distinguished Professor. In addition to teaching Mycology and running a research lab, Joey serves as Department Head of Botany and Plant Pathology. 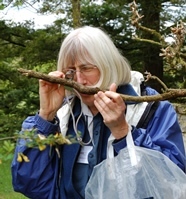 Professor Susie Holmes is a founding member of the Cascade Mycological Society and biology faculty member at Lane Community College in Eugene, Oregon where she teaches mushroom biology and plant science courses. 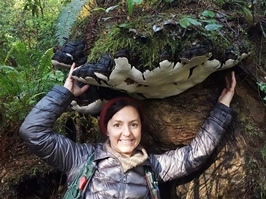 With interests in biodiversity and landscape ecology, she works with students in her classes to research phenology and fungal ecology and has co-founded a local mycoflora project titled Macrofungi of Lane County. Dr. Amy Rossman received her Ph.D. from Oregon State University then worked as a postdoc at Cornell University with Richard Korf and the New York Botanical Garden with Clark Rogerson. Finally she got a permanent job (much to her parents’ relief) with the USDA in Beltsville, Maryland where she served as Research Leader of the Mycology Laboratory (under various names) and Director of the U.S. National Fungus Collections for thirty years. She specializes in the systematics of microfungi especially those of importance to agriculture. Ron Hamill has spent a lifetime afield observing nature. He discovered mycology while attaining a botany degree and has been deeply interested in the taxonomy and ecology fungi ever since. 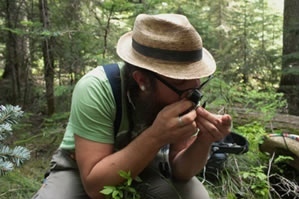 He has worked as a field mycologist and botanist for more than 25 years, doing surveys to describe habitats, and to record and document rare and uncommon species from California to Alaska. He is a member of the Pacific Northwest Key Council is a founding member of The Cascade Mycological Society. He, along with co-pilot and dog Rubi, live in fungal Shangri-La on the North Umpqua River in Douglas County Oregon, where they look for fungi nearly every day of the year. Eric Jones was born and raised in Salem, Oregon and has been harvesting wild edible fungi for 40 years. 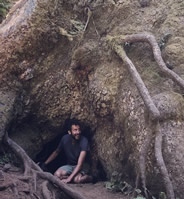 He is an environmental food anthropologist that has published broadly on edible fungi and other nontimber forest product harvesting cultures. He started and ran Pacific Mushroom and Truffle from 1993-1998, co-founded the Institute for Culture and Ecology, and is a former professor. He continues to do research through courtesy appointments at OSU and UO and through his consulting firm, Wilamit LLC. Bitty grew up in Castle Creek Valley, near the town of Aspen, back before it was discovered and ruined by movie stars and lots of money. The Rockies have great flushes of late summer boletes, which line the mountain trails like flap-jacks, and contributed to her early interest in mushrooms, as did the finding of a Stemonitis slime mold and being told by her high school biology teacher that it was “rare” (it wasn’t). She finished her undergraduate degree at Evergreen, where Mike Beug nudged her a bit further in the direction of fungi. However, her first foray into graduate school was a degree in Paleobotany at Southern Illinois University. While working on her masters she took Forest Pathology with Walt Sundberg and has not seen the world the same way since. Her PhD work at Claremont Graduate School was an examination of how pathogens influence plant population genetics, and included the discovery of a rust fungus that mimics flowers, which she followed up on with a National Science Foundation Fellowship at UC Davis. Since Berkeley was nearby, she also spent a lot of time in the Bruns lab. Her first faculty position was at the Swiss Federal Institute of Technology, the ETH, which is Europe’s MIT, where she received tenure and continued her work on fungal mimicry. 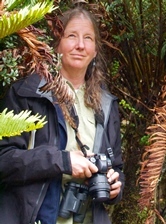 She moved to the University of Oregon in Eugene in 2001, where she has divided her research time between plants and fungi in the local prairies and the ecology of tropical fungi. Roo Vandegrift was born in the Appalachian mountains of southwestern Virginia, but spent most of his childhood as an Air Force brat. Roo completed his undergraduate work at Virginia Tech, in Dr. RH Jones’ soil ecology lab, and then worked for several years at a venture capital funded biotech company, where he learned the meaning of “cut-throat” and “exit strategy.” Moving back to his roots, so to speak, he took a lab technician job with Dr. Brenda Casper at the University of Pennsylvania. There, he decided that he really did like fungal ecology enough to start a career in the field. Roo finished his PhD in 2016 in Dr. Bitty Roy’s lab at the University of Oregon, with a fair bit of shared advising by Dr. George Carroll. In 2013, he participated in NSF’s East Asia and Pacific Summer Institute (EAPSI) program in Taiwan, where he was able to work with the incomparable Xylariaceae taxonomist Dr. Yu-Ming Ju. 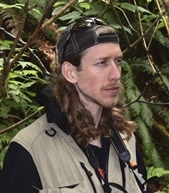 Since receiving his doctorate, Roo has been working as a post-doctoral scholar at the University of Oregon’s Biology and the Built Environment Center, studying the interface between fungal ecology and building science. Currently, he is working on a large EPA funded study examining the impacts of home weatherization on the microbial (fungi and bacteria) communities found in household dust, among other things. In his spare time, functions as the Herbarium Liaison with the North American Mycoflora project, volunteers as an Executive Board Member for the Rainforest Information Center’s campaign to reduce the impact of expanding metals mining on protected forests in the Ecuadorian Andes, and studies the taxonomy and systematics fungi in the Ascomycete family Xylariaceae. 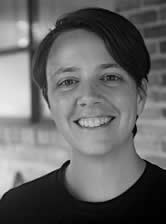 Seri Robinson is a professor at Oregon State University, an avid woodturner, and a writer of science fiction. More info: https://www.northernspalting.com Seri's current work involves the development of colored pigments on wood by mold fungi. As molds are some of the most reviled fungi in the world, their use in functional art is controversial and challenges our core assumptions on toxicity, functionality, and understanding of the natural world. The natural world has intrigued Scot Loring since childhood. A Pacific Northwest native, Scot attended The Evergreen State College and Oregon State University. 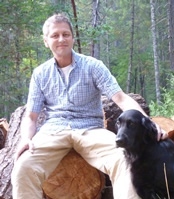 Since 1995, he has worked as a mycologist/botanist for various entities across the western U.S. and is a founder and owner of Pacific Crest Consulting, LLC, an environmental consulting firm. 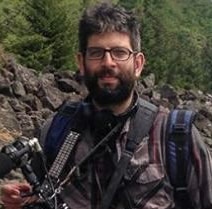 He is a board member, test examiner, and editor-in-chief for Northwest Lichenologists. He is co-author of the book Rare Lichens of Oregon and has discovered a total of almost forty species of previously undescribed lichens, truffles, and plants. 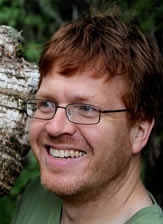 Adolf Ceska, PhD (UVIC Canada) is a plant ecologist with focus on vegetation and vegetation classification. From 1981 through 1995, Adolf was a herbarium curator in the Royal British Columbia Museum and then a Rare Plant Communities Specialist for British Columbia in the Conservation Data Centre. 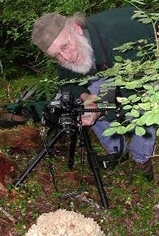 Since his retirement in 2002, Adolf has been involved in Oluna's mycofloristics projects as her field assistant, computer assistant, and mushroom photographer. Since 1991 Adolf has been editing BEN (Botanical Electronic News), which became one of the first botanical electronic journals. 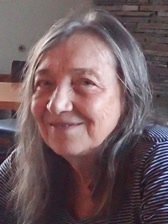 Oldriska (Oluna) Ceska has a Masters degree (equivalent) in mycology & phytopathology from the Charles University in Prague (thesis on “Melanconiales of Czechoslovakia”). After coming to Canada in 1969, she worked as research associate at the Biology Department, University of Victoria in phytochemistry and genetics on the flavonoids in corn, and then on a study of furocoumarins in umbellifers. Her greatest achievement during the latter part of her UVIC career was the discovery of coriandrin, until then an unknown furoisocoumarin in cilantro. After her retirement in the late 1990s, she participated in several rare plant surveys in BC. At the same time, Oluna returned to mycology and has been working on the mycofloristics of various parts of British Columbia. Since the fall of 2004, she has been conducting an intensive mycofloristic survey of Observatory Hill in Victoria, BC. When not swamped smelling super small sporocarps of some Scutellinia scutellata, I enjoy wild culturing the human-fungi relationship. My excitement for open-source science, Polypores, and remediation drives me to organize myco-projects and gatherings as Fungi for the People since 2010. From our new mountain farm and research base we grow organic certified mushrooms, and are establishing ecologically dynamic fungi and fruit/nut/herb orchards. I’ll be bringing lab materials along for doing tissue culture work with any interested folks over the foray weekend. Skye Weintraub, ND, is a naturopathic physician in private practice since 1989 in Eugene, OR. She specializes in allergies and digestive disorders, especially the overgrowth of bacteria and parasites. 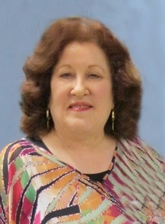 Dr. Weintraub is the author of numerous health-related books including The Parasite Menace, Allergies and Holistic Healing, and ADD and Hyperactivity. In the early 80s Dr. Weintraub became interested in the study of wild mushrooms while taking a class at the local community college in Eugene. She has been studying, photographing, and eating many of these mushrooms ever since. She is also a past president of the Cascade Mycological Society where she served on their Board of Directors for many years. Fred grew up in the northeast but made his way to the northwest in the early 1970’s and has lived here (Bellingham, WA mostly) ever since. Masters and PhD degrees were from OSU and UO respectively and were based on in situ (i.e. in the canopies of old-growth Douglas firs) studies of the nitrogen-fixing lichen Lobaria oregana. Fred taught mycology and biology at Western Washington University from 1977 to 2009. Since then he has enjoyed the freedom to investigate all realms of cryptogamic botany with his camera. Danny first got interested in mushrooms in 2007 after seeing strange colourful creatures in the forest all the time while hiking and skiing off trail, and finally decided he had to find out what they were. The more he learned, the more interesting they seemed, and it just hasn't stopped. Danny is the Education Chair for the Puget Sound Mycological Society in Seattle, helping to design and teach the curriculum for the club's mycology classes. He is also the club Librarian, and ID Committee co-ordinator and emergency poisoning point person for King County Washington Poison Control. 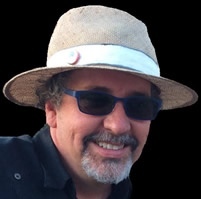 Danny also belongs to the PNW Key Council, a group of amateur and professional mycologists and is a co-author of MatchMaker with Ian Gibson, the free PNW mushroom ID program for the PC and MAC. He has a big interest in taxonomy and figuring out where all of the mushrooms fit into the fungal tree of life. Leon Shernoff is currently entering his sixteenth year as editor of the internationally distributed magazine Mushroom, the Journal of Wild Mushrooming. In addition to Mushroom the Journal, his columns on wild mushrooms have appeared in The Wild Foods Network, Backwoods Home Magazine, and Mycophile, the newsletter of the North American Mycological Association. A former president of the Illinois Mycological Association, Leon has given mushroom talks and identified mushrooms for forays in California, Connecticut, Illinois, Maine, Minnesota, Missouri, New York, Oregon and Washington. He has collected fungi that are now part of the permanent collection of the Field Museum in Chicago and the New York Botanical Gardens. Leon stresses the wonder of fungi and their interactions with nature, rather than just identification of species and knowledge of edibility. He is also one of the rare people who can present technical information with historical background and humor, instead of just masses of detail. From the often-overlooked to the all-too-common, Leon usually has that little extra bit of information that makes us aware of the marvel and mystery that is mushrooming. 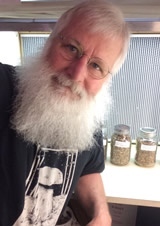 Dr. Charles Lefevre is the founder of New World Truffieres, Inc., the leading producer of inoculated truffle trees in North America, and co-founder and visionary force behind the Oregon Truffle Festival, which celebrates and promotes the native and cultivated truffles of Oregon. Dr. Lefevre is widely recognized as a pioneer of the North American truffle industry, and his work is bearing fruit with ever-growing numbers of orchards beginning to produce commercial crops of truffles. 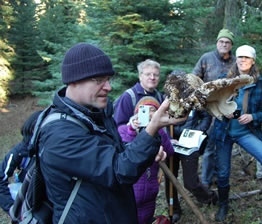 He received his PhD in Forest Mycology at Oregon State University, where his dissertation focused on the host associations of the American matsutake mushroom. Joe Spivack has been an. Interested in mushrooms for over 32 years. He started by taking the local legendary mycologist Freeman Rowe’s Lane community College one semester fall mushroom course in 1985. He has helped with the annual Mt. Pisgah Mushroom show for about 25 years. He taught a Lane Community College adult education course for nine years entitled “Wild Mushrooms”. Spivack has been member of Cascade Mycological Society since its second year, 2000 to the present. He was on the Board of Directors of CMS for roughly 10 years, from 2000- 2010. He has led forays for the annual Yachats Mushroom festival for over the past 15 years. 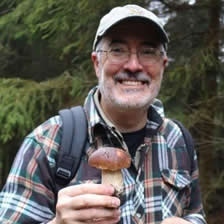 John Donoghue is president of Northwest Mycological Consultants, Inc (NMC), an Oregon-based firm serving the specialty-mushroom industry since 1985. NMC produces top-quality spawn and supplies for the commercial mushroom industry worldwide and has developed a line of automated inoculation equipment and a suite of mushroom cultivation bags specifically for the spawn and specialty–mushroom industries. John has been instrumental in developing the specialty mushroom industry in the Pacific Northwest and has worked on mushroom-production and research projects around the globe, including in Vietnam, Laos, Bhutan, Colombia, Japan, Taiwan, Mexico, Argentina, Iceland and Australia. 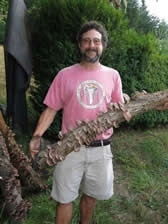 John Donoghue is a coauthor of “The Shiitake Growers Handbook, the Art and Science of Mushroom Cultivation”, a definitive resource for shiitake growers worldwide. He has published dozens of scientific research and industry review articles about mushroom cultivation and has given presentations at industry and scientific meetings on most continents. John has a unique perspective of mushroom cultivation based on his far–flung involvement with a diverse array of production systems and research projects. Richard Tehan is originally from upstate, NY. He received a B.S. in chemistry at Utica College, in Utica, NY. He is now in his fourth year of a medicinal chemistry PhD program at Oregon State University, College of Pharmacy. His research is on drug discovery, chemical ecology, and the evolution of secondary metabolism of fungi in genus, Tolypocladium, better known by their synonyms Cordyceps and Elaphocordyceps. This group of fungi exhibits diverse ecologies including as mycoparasites, entomoparasites, and endophytes. Tehan is presently focused on the isolation, structure elucidation, and biological characterization of peptide natural products produced by newly discovered tropical endophytic species of Tolypocladium. In his leisure time, he enjoys collecting and photographing wild mushrooms.